Put some spice in your life with this spicy mac n’ cheese topped with a cornbread topping. 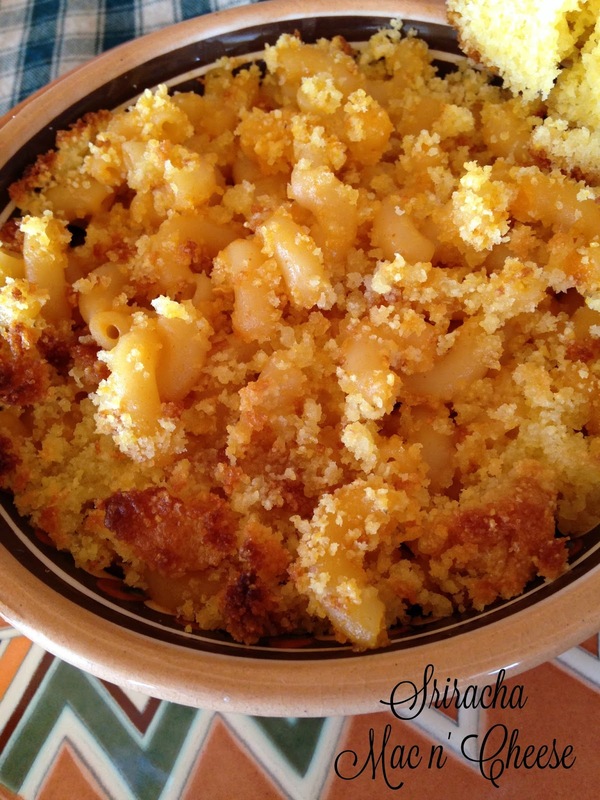 Why a cornbread topping? Because one thing we love here at Turnips 2 Tangerines is a crunchy, buttery topping. 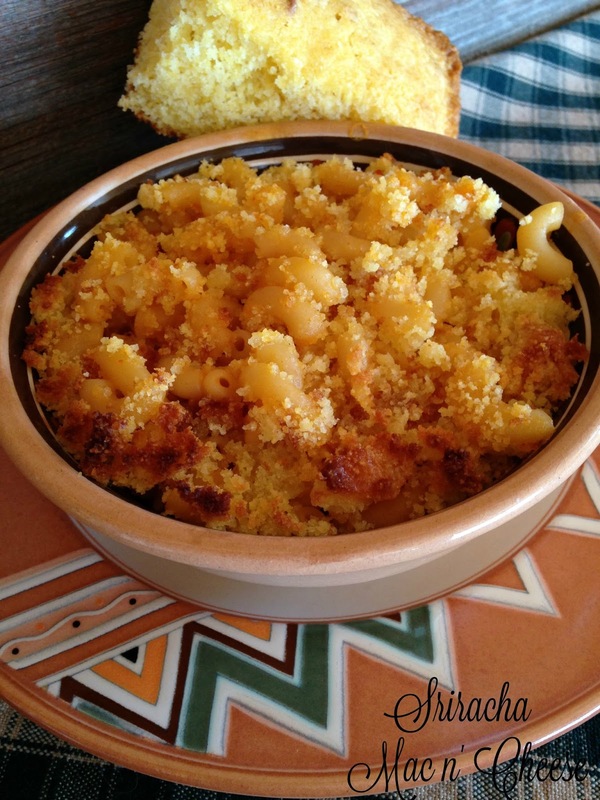 This is definitely an adult version of mac n cheese…unless of course, your children love hot and spicy food! Sriracha Mac n’ Cheese is not for the faint of heart. It definitely has a zip and a zap to it. The cornbread topping helps to cool down the flames…that and a glass of milk. Thai hot sauce named after the seaside town of Si Racha, which is located along the Gulf of Thailand. The town’s well known for its seafood, which is usually served with Sriracha sauce. The bright red sauce, a mixture of sun-ripened chilies, garlic, sugar, salt and vinegar, has the consistency of American ketchup. Sriracha sauce has become so popular that it’s as ubiquitous on the Southeast Asian table as ketchup is on the American, and it’s gaining popularity in a variety of other cuisines. Preheat oven to 350º Grease an 8 x 8 inch square baking pan. In a medium mixing bowl, combine cornbread mix, egg, vegetable oil and milk. Stir just until combined. Pour into prepared pan. Bake for 25 minutes or until toothpick inserted in the middle comes out clean. Cool on wire rack. Bring a large pot of water to a boil. Cook pasta according to package directions or until al dente, drain and set aside. In a large bowl combine crumbled cornbread, 1 1/2 cups of shredded cheddar cheese, 1 tablespoon sriracha sauce and 3 tablespoons melted butter, mix to combine. Place half of this mixture into prepared pan. Set remaining mixture aside. In separate bowl, combine 2 cups cheese, red pepper flakes, remaining sriracha sauce, and 1 tablespoon butter. 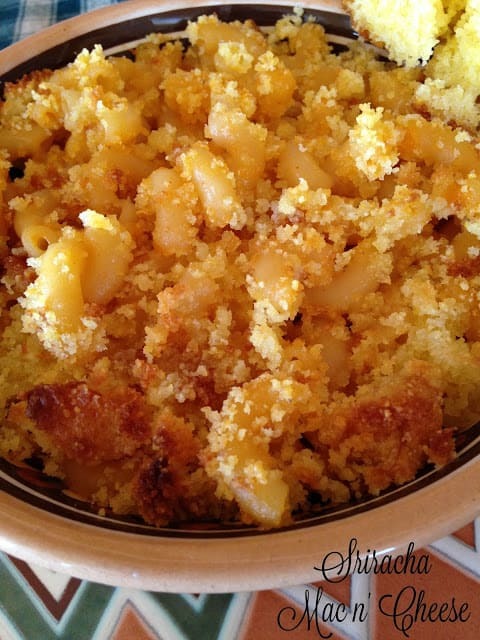 Mix to combine, then add cooked macaroni, beaten egg and milk. Stir until combined and evenly coated. Empty all of this mixture into prepared pan, add remaining cornbread topping, pressing down lightly. Dot top with cubed butter. Bake for 25 to 30 minutes. Remove from oven and cool for 5 minutes before serving.